The recipes get hardier as we progress throughout the season. 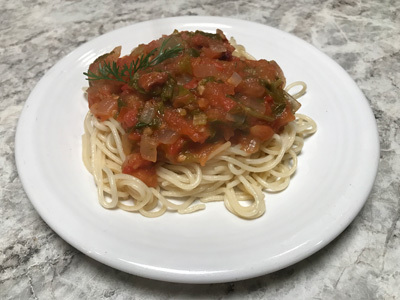 This weeks recipes include a braised celery dish which uses fresh tomatoes and baby celery. It's hard to describe how wonderful and fresh this taste. The baby celery complements the fresh tomatoes so nicely. 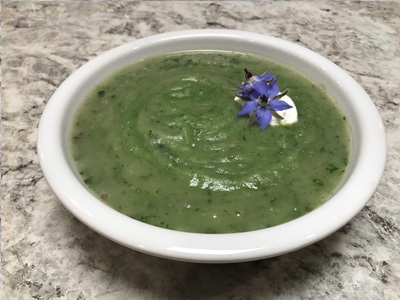 The borage greens are used in a hardy soup dish that is very satisfying especially with a dollop of sour cream. We hope you enjoy using this week's share. Add 1/2 lb of black-eyed peas to a stock pot and add enough water to cover the beans by 2 inches. Bring to pot to a boil for several minutes, then drain and rinse beans in colander, and add to pot again with water covering the beans by 2 inches. Add 1/2 diced onion, 1 bay leaf, and 1 tsp of salt. Cook for 30 minutes uncovered on medium heat. Then drain beans in colander and set aside. Remove the stem and mid-rib from 1 bunch of collard greens and 1/2 bunch of kale. Chop greens into 1 inch ribbons. Preheat oven to 350 degrees F. Add 2 tbsp of olive oil to large oven-safe skillet and bring to medium- high heat on stovetop. Add 1/2 diced onion and sautee for 4-5 minutes. Add 2 cloves of garlic and sautee for 2-3 minutes. 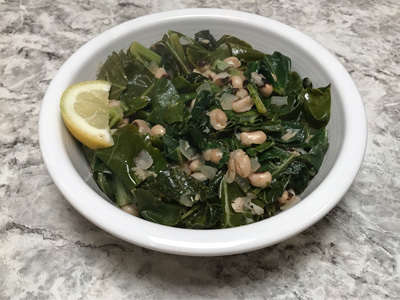 Add collard greens and kale in small batches, continuing to add more greens as the previous batch wilts until all greens are wilted in skillet. Combine 2 tbsp of tomato paste with 1/2 cup of water and add to pan while stirring with spatula to scrape pan bottom. Add cooked black-eyed peas and just enough water to cover mixture. Add lid to skillet and cook in preheated oven for 30 minutes. Remove from oven when greens are to the desired level of tenderness, then add a generous squeeze of lemon juice to the greens before serving. *The 1 lb of chicken breast will be divided between this salad and Spicy Mustard Greens with Paprika Chicken. To prepare homemade ranch combine 1/2 cup mayonnaise, 1/4 cup of sour cream, 1 tbsp each of chives, dill, and parsley, and 2 tsp oregano, all finely chopped. Add 1/2 tsp of salt, 1/2 clove of garlic, 1 tbsp of buttermilk or regular milk, 1 tsp of white vinegar, and 1/2 tsp of paprika. 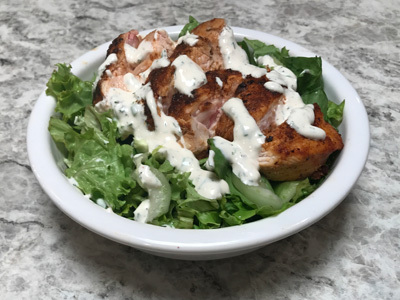 Prepare 1 lb of chicken breast by coating top and bottom with a rub with equal parts salt and paprika, and 1/4th part crushed black pepper. If chicken breast is thicker than 1 inch, butterfly breast, then then coat with paprika rub. Melt 2 tbsp of butter in a cast iron skillet, then add chicken and cook covered on each side for 10-15 minutes, and remove from heat when the chicken is cooked through. Saute 1/8th of a yellow onion (about 2 tbsp) in 1 tbsp of vegetable oil over medium heat for 4-5 minutes. Then add 2 cups of chicken stock and 1 russet potato chopped into 1/2 inch cubes. Boil potato in water until softened, about 15 minutes. Rough chop 1 bunch of borage greens, and 1/4th cup total of chives, dill, parsley, and oregano. 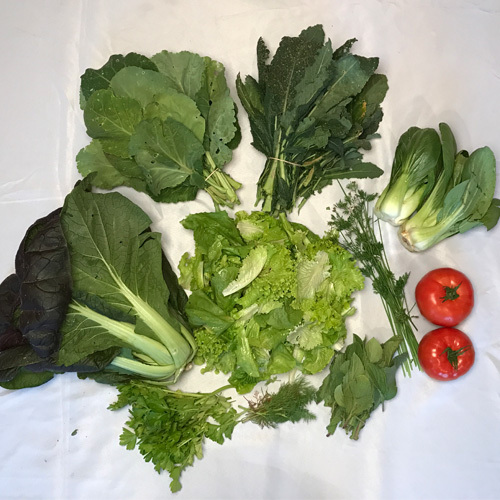 Bring a pot of water to a boil, then blanch both borage greens and herbs by submering the greens in the boiling water for 1 minute, and then transfering the greens to an ice bath. Once cooled transfer greens to soup stock, add 1 tsp of salt, and allow to simmer for 10 minutes. Allow soup to cool, then process soup with an immersion blender or in a food processor. Add a dallop of sour cream and a squeeze of lemon before serving. Add 2 tbsp of cooking oil to skillet and bring to medium heat. Saute half an onion and three cloves of garlic until onions start to caramelize. add 1/2 cup water a teaspoon of paprika and the chopped mustard greens a little at a time until everything is tender and the greens are cooked down. 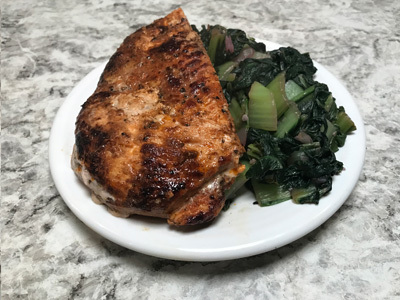 Take 1/2 lb of paprika chicken (paprika chicken recipe above), and plate with mustard greens. Add 2 tbsp of olive oil to skillet over medium heat and saute 1/2 yellow onion for 4-5 minutes. Dice 1 bunch of baby celery greens, 2 beefsteak tomatoes, and 1 tbsp of parsley. Add celery and tomatoes to skillet and cook over medium heat for 20 minutes. Cook 1/2 lb of pasta (8 oz or half of a standard package) according to package instructions. Chop 2 oz of pancetta (or cooked bacon, about 4 strips) into 1/4th inch cubes. Remove braising mixture from heat and mix in pancetta or bacon. Plate mixture atop a bed of pasta.